After taking our complimentary airport shuttle to the hotel, settle into your spacious accommodations at Sheraton Suites Chicago O'Hare. Our Rosemont hotel is located just down the street from Allstate Arena, where you can cheer on the local hockey team or watch a concert. If you're in town for business, the Donald E. Stephens Convention Center is only 2 miles away for easy access to conferences and events. In the morning, start your day off right with a stop by our 24/7 fitness center, featuring strength training equipment and cardio machines. Traditional breakfast fare is served at Myrick's, our in-hotel contemporary American restaurant, offering a selection of healthy lunch options and a delicious dinner menu, all of which is available from room service. When you return to your executive-style suite, enjoy a separate living area, a wet bar and a pair of 55" TVs. 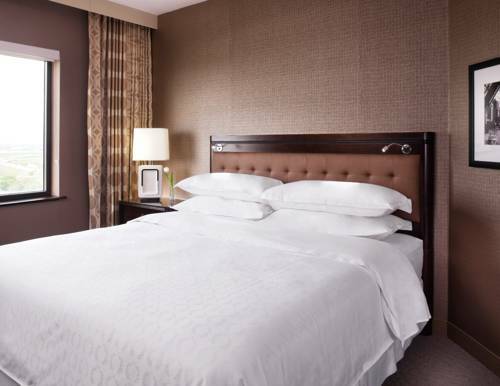 At the end of the night, get a peaceful night's sleep in our luxurious plush beds with custom duvets at Sheraton Suites Chicago O'Hare. Myrick's: Join us for all-day dining after a busy day of travel to Rosemont at Myrick's, our contemporary American restaurant located just moments away from Chicago O'Hare Airport.